When you hear the word insulin what sort of things come to mind? Or, maybe you have never heard of insulin - or maybe you have heard of it, and that is about it. Turns out, insulin is one of the driving factors in why we gain weight, get heart disease (high cholesterol, blood pressure and triglycerides), metabolic syndrome, diabetes and obesity. Let me explain. Insulin is an anabolic, building storing hormone known as the master hormone. Hormones are basically messengers in the body that tell things what to do and where to go in order for our body to stay in balance and function well. In the case of insulin, it is made in the pancreas and is released in response to rising levels of blood sugar. So, how does blood sugar rise? When we eat carbohydrates, especially refined ones like bread, cereal, rice, pasta, candy, cokes, rice, corn and sugar, blood sugar levels rise. Insulin then comes and takes the sugar from the blood to our other body cells for energy. The more carbohydrates (especially refined, processed ones), and the more often we eat, the more insulin that is released. When we eat eggs, avocado and bacon, hardly any insulin is released because there are few carbohydrates in those foods. Whereas, when we eat oatmeal, toast, yogurt or cereal, a lot of insulin is released because those foods are much higher in carbohydrates. The process works fine until our cells become too full of sugar. Because of our tendency to overconsume, especially refined carbohydrates, our cells eventually become too full of sugar. To protect themselves from damage due to toxic levels of sugar, they start ignoring insulin’s message to store, becoming insulin resistant. The pancreas senses this and produces more insulin to keep blood sugar levels down. High insulin levels are just as dangerous as high blood sugar levels – but unfortunately, our doctors don’t measure or talk about this as much. High insulin levels cause damage to the heart and the cardiovascular system and promote weight gain. The more insulin floating around in the blood stream, the more fat we store which leads to weight gain. So, when our cells start ignoring insulin’s message to store sugar, the pancreas produces more insulin to compensate for that to keep blood sugar levels down. Therefore, more insulin is present in the blood stream, leading to excess storage and weight gain. Further, insulin hardens the lining of the arteries causing high blood pressure. In fact, a very early warning sign of diabetes is high blood pressure. Further, when our body has too much sugar that needs to be stored because we overconsume carbohydrates, insulin changes sugar into triglycerides through a process called lipogenesis and stores it in our fat cells causing our body to become bigger and bigger, leading to a whole host of other problems including metabolic syndrome, diabetes and obesity. Another reason elevated insulin levels are problematic is that high levels of insulin block nutrient absorption thus, causing nutrient deficiencies. This whole process starts when we overCARBsume certain foods. Once we are insulin resistant, inflammation and other problems arise, including weight gain and metabolic syndrome. 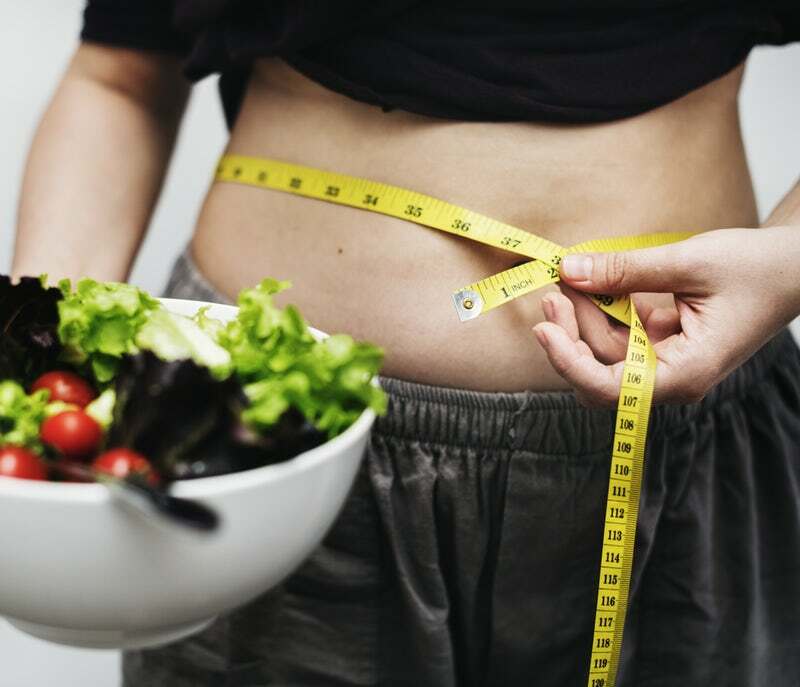 Lowering our insulin levels is the real key to weight loss, weight management, sustained weight loss, reversing certain chronic health conditions and reversing the damage done to our bodies. In order to lower insulin levels and improve your body’s sensitivity to insulin, you need to consume less carbohydrates and completely eliminate grains, bread, cereal, pasta, sugar sweetened beverages and other refined and processed carbohydrates from your diet. So how do you know if you have high insulin levels or if you are insulin resistant? There are several ways to tell. If you have any of the following, you likely have high insulin levels and/or are already insulin resistant: extra body weight around the stomach, a fasting blood sugar above 100, an A1C above 5.7, high cholesterol, high blood pressure, high triglycerides, muscle weakness, fatigue (tiredness), cognitive brain fog, loss of memory, vision problems, headaches, shaking/trembling, artery inflammation, skin tags, acne, PCOS, gout, fatty liver, weight gain, obesity, not satisfied after eating, nutrient deficiencies, often feel hungry (cells are not well fed), and leptin resistance (more on Leptin resistance in a future article). A couple of more facts for thought: Two slices of bread will raise blood sugar more than 6 teaspoons of sugar and monosodium glutamate (MSG) also known as modified food starch, can raise insulin up to 300% above fasting levels. MSG is a flavor enhancer and is added to most of our packaged foods. Check your food labels for these words and avoid foods with MSG. Check out our recent instagram post on the dangers of MSG and other words used to mask the use of MSG in common foods by clicking here. If you would like our help modifying your diet, reversing or better managing chronic disease or just want to feel better and have more energy, please consider joining one of our Challenge Groups like our upcoming Low Carb and Keto Group or scheduling an initial consult. To schedule a consult click here. The consults offer a great way for you to meet us and establish a plan of action, so you can heal and thrive. We would love the opportunity to help educate and empower you, so you can be your best you! Our next group will be amazing and will offer you incredible support and vital information for sustainable change. To learn more or to join, click here.